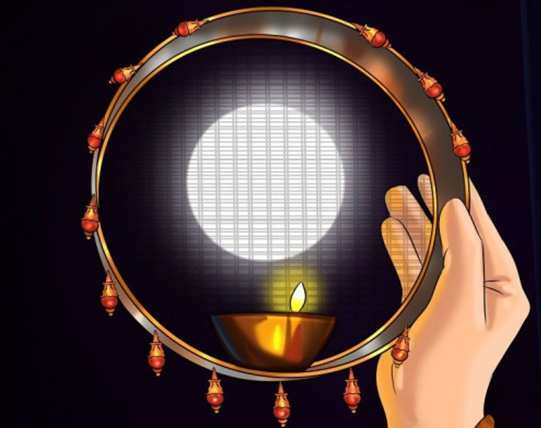 Karwa Chauth (17th Oct., 2019 Thursday) is a one-day festival when married women fast from sunrise to moonrise without water for the safety and longevity of their husbands. Indian stat	es like Rajasthan, parts of Uttar Pradesh, Himachal Pradesh, Haryana, and Punjab have the celebration at an extensive scale. It falls on the fourth day after the full moon, in the Hindu luni-solar calendar month of Kartik (November-December). Karwa Chauth concurs with Sankashti Chaturthi for Lord Ganesha. 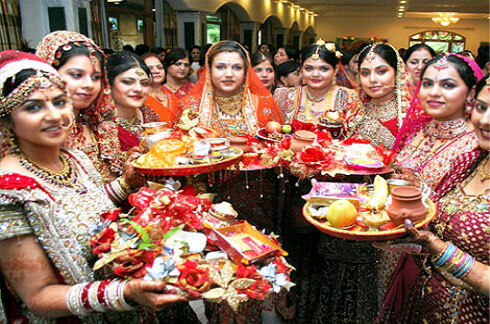 Married women engage in the fasting of Karwa Chauth and its rituals. They worship Lord Shiva and His family including Lord Ganesha and break the fast only after seeing and making the offerings to the Moon. The fasting of Karwa Chauth involves intake of no food or water after sunrise till the sighting of the Moon in the night. The word ‘Karva’ or ‘karwa’ means 'pot', an earthen pot for carrying water and ‘chauth’ means 'fourth' in Hindi because it is observed on the fourth day of the dark-fortnight, or Krishna Paksha, of the month of Kartik (November-December). The festival started only in the north-western part of India. There are different versions of the origin of the festival. Soldiers would leave their wives and children. Their wives would often pray for their safe return and longer life. Interestingly, the festival also concurs with the beginning of Rabi crop cycle. Large earthen pots are used to store wheat grains. 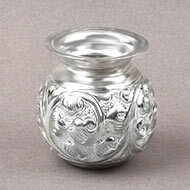 These pots are called as Karvas. So it is believed that the fast may have started as a prayer for good harvest in the regions where wheat grains amply grew. Another version is that young girls feeling too much separation from the family due to marriage used to befriend another woman married into the same village. Their friendship was sanctified along with the marriage ceremony. The bride and her new friend would gradually become close friends. This would comfort the bride during her being with her new family. Both the bride and her friend would seek help from each other, thereby making their friendship stronger until they became like god-sisters. Karva Chauth started to celebrate this bond between the brides and their new friends. 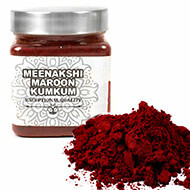 Sindoor (Vermillion Powder), Dhoop Batti - 1-2 units, Agar Batti - 3-5 units, Matchbox - 1 unit. Decorated Karva (Mud pot with an outlet to the side) - 1 Karva if you plan to do the puja in a group, 2 Karvas if you are doing the puja alone, Red Chandan , Mouli/Janeu (Sacred Thread), Mitti Diya / Mud lamps - 2 to 3 units, Ghee/Oil (for use in the diya). Rangoli, Powder - Colors and amounts as required Rangoli Making Instruments (if required), Kapoor / Camphor balls - (for use in the diya if required), Small garland of flowers - 1-2 garlands, Circular Sieve - 1, Cotton (used as wick in diyas as well as to block the exit of the Karva), Food ingredients (used during the puja), Clean Drinking Water. 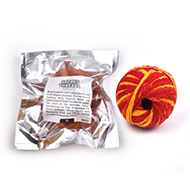 Alta / Red Dye for Hands & Feet, Nail Polish, Hair Clips and other decorative items as needed, Indian Anklet (Payal), Fruit Juice, Sweets (Home-made or purchased from shops), Fruits, Puri, Kachori and Halwa. 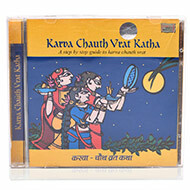 Start preparing for the Karwa Chauth festivities in advance. 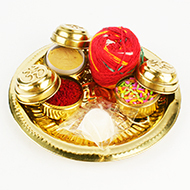 If you have made plans to celebrate it, buy make-up and cosmetics (shringar), jewellery and Karva lamps and plates. Remember that the local shops and bazaars have exclusive products so you have a plenty of options. Get up before sunrise on the day of Karva Chauth. Have something to eat and drink. Women in Uttar Pradesh eat soot feni a night before the day of celebration (a traditional Garbanzo bean and milk dish) with milk in sugar. 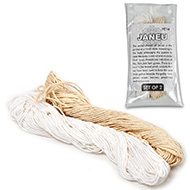 It is said to help the women abstain from water the next day. Women in Punjab have the sargi (ਸਰਗੀ) in Punjab that serves as pre sunrise meal. On the day of Karwa Chauth, spend time with the other women in your community. Paint Henna on each other's hands and feet. It is better if you get your husband (or fiancé) involved. Husbands offer gifts and treats in exchange for the tough fasting and prayers of their wives. At Around 4 pm in the afternoon, have a small square area (40 cm x 40 cm should be sufficient) next to a vertical wall inside or outside your house. Ensure your clean the area with water. In the middle of the area create a Swastik mark with Turmeric. Place the Karva Chauth Calendar (i.e. image of Karva Chauth) against the vertical wall. The Karva Chauth Calendar has images of Goddess Parvati, Lord Shiva, Lord Kartik and Lord Ganesha as well as the representation of the Karva Chauth Katha/Story. Just before the image, place a small bowl with raw rice grains. Have rouli (red chandan), mouli (sacred thread), haldi powder (turmeric powder), a glass of clean water or a glass of milk, a clean betel leaf and a betel nut in a plate. 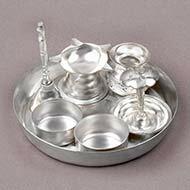 The kindly place the karva in the center of the Swastik mark that you created and fill it with water or milk. Make sure you put cotton on the side of the Karva to stop liquid spill. Close the top of the Karva with its cover and over the cover place grains of wheat and sugar. Now apply the red chandan to the Karva and then tie the mouli (sacred thread) around its neck. If you are performing this ritual along, prepare another Karva repeating the above steps. Keep this second Karva next to the image of Karva Chauth. This Karva is said to belong to Goddess Parvati. Dip the Mango leaves into the glass of water/milk and use it to sprinkle some of the liquid onto the image of Karva Chauth. Now apply red chandan to the images of Gods on the Karva Chauth calendar. 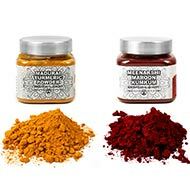 Then mix a small amount of turmeric and raw rice grains and sprinkle it on the image with your fingers. 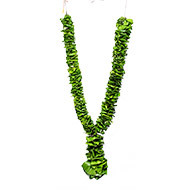 Place the betel leaf before the image and on the top of it, place the betel nut. Next is to do a recitation of the story of Karva Chauth, also known as ‘Karva Chauth Katha’. These stories can be read in any language of your choice. Keep in mind that while reading or listening to the story, you should hold some raw rice grains in your fists. When each story is completed, loosen your fist and place the rice grains into the pallu of your saree. Then take another fistful of rice as the next story is recited. 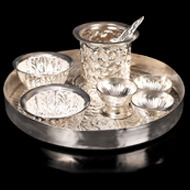 After the katha recitation, donate the Karvas to a near-by temple. 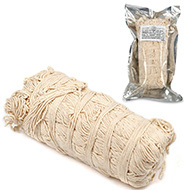 Also the rice grains used during the ritual should be donated to the temple. Then touch the feet of all elders in the family to seek their blessings. Once you see the Moon in the sky, light the diya (mud lamp) on the plate and ensure you have a direct view of the Moon. Your husband should accompany you during this ritual. Offer prayers to Chandra, the Moon god in whatever language you are comfortable. First worship the Moon with the plat that has the diya and move it in a circular motion around the image of the Moon. Sprinkle raw rice grains and turmeric powder in the direction of the Moon. Following this, offer the pot of water to the Moon. Just hold the pot in the direction of the Moon and pour some of the water into the ground before you. Leave some water in the pot as you will need it to break your fast. Close your eyes and pray to Chandra for your wish. Look at the Moon through the circular sieve and then at your husband. Your husband should now break your fast by first giving you some water from the pot. He should then take food items and offer you. Now carry the plate inside, give it to your mother-in-law. Then touch her feet and she would bless you. Enjoy a delicious meal with your family.